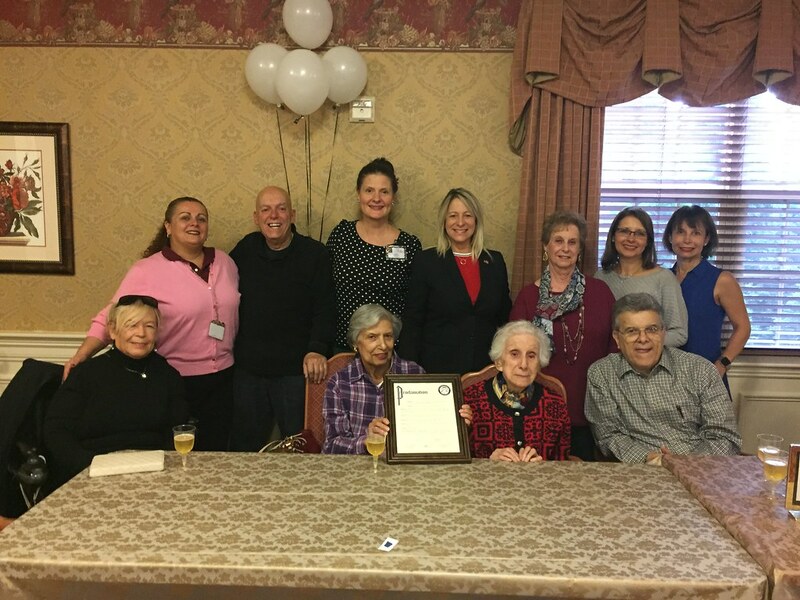 On Tuesday, November 7th, Mayor Gloria McCauley was honored to be invited to a 100th birthday celebration for Hillsborough resident Carmel Cucinotta, who turned 100 years old on November 6th. Ms. Cucinotta, born in Jersey City, has led a full and interesting life. She obtained her bachelor’s degree from Northwestern University and a Master of Arts degree from Columbia University. Carmel worked as an elementary school teacher in Livermore, California for 5 years and then relocated back to New Jersey in 1955. She then worked for the Jewish Guild for the Blind in New York City as a social worker. Once, while on vacation in Mexico, Carmel saw a need to help children develop their senses through sign language. That trip resulted in Carmel living in Mexico for 10 years teaching sign language to children. Today, Carmel is still an avid reader and enjoys attending the entertainment events provided by Avalon. Happy 100th Birthday to Carmel Cucinotta!